Celebrate the holidays with our new 911 strong Christmas bear ornament. 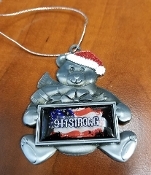 this 2.75" die-cast ornament in the shape of a bear wearing Santa’s hat features our 911 strong logo. The Santa Bear hat has decorative jewel glitter that makes it shine on your tree or anywhere you hang it. Get one for your tree at home, work, or give them as gifts. The first 200 we sell will also include a nice velvet pouch at no extra cost. HAPPY HOLIDAYS FROM EVERYONE AT PSTC 911 CARES.